“The universe keeps pushing us together,” says one of the two teens destined to become the title characters on Cloak & Dagger, Marvel’s latest televised superhero adaptation, and the other one replies, “The universe keeps pulling us apart.” It’s a fittingly meta commentary on the writing team for this show, who has chosen to separate this duo for most of the initial episodes, barring the occasional run-in. And that’s unfortunate—this is the first real conversation these two have had, and it’s four episodes into the series. Freeform’s initial foray into the Marvel Universe eventually finds its footing, but it takes too long to get there. The story of two superpowered youths has made some notable changes in its transition from the pages of Marvel comic books to TV. One of the biggest initial problems is one shared by its Marvel Netflix brethren, in that the story simply takes far too much time setting up its world before getting to the main event: pairing up its title characters. For the first several episodes, a more apt title would be A Couple Of Kids Who Will Eventually Be Cloak And Dagger Spending Almost No Time Together. Patience is only a virtue when it rewards by creating something greater, and there’s very little here that wouldn’t be improved by getting the charismatic young stars in the same room much sooner. Tandy Bowen (Olivia Holt) is a young homeless teen, hustling for cash and occasionally dropping in on her mother (Andrea Roth), who has an alcohol problem. Tyrone Johnson (Aubrey Joseph) is an overachieving high school student with fiercely demanding and protective parents. Individually, their stories are decent enough to sustain a little drama, but the show improves drastically when they’re together, the two leads’ excellent chemistry creating a potent center around which to anchor this series that too often keeps them far past arm’s length. The secret that connects these two damaged people stems from shared childhood trauma. Tyrone’s older brother was shot and killed by a cop when he was just a child, the same night Tandy’s father died in a car accident, his daughter in the backseat. The two kids both found themselves plunged into the sea at the very moment a nearby rig containing top-secret materials (courtesy of recurring Marvel menace Roxxon Energy Corporation) exploded into the water, imbuing them both with strange talents that don’t manifest until they come back into contact with one another years later. Their powers are confusing and unpredictable: Tandy seems to manifest a white light from her hand, that occasionally takes physical form, while Tyrone will occasionally find himself teleported halfway across the city, with seemingly no way to control it. They also share a nebulous and confusing ability to enter memories and/or see others’ hopes and fears, an odd skill the series doesn’t care to explain and mostly deploys when narratively convenient, allowing a kind of shortcut around the “show, don’t tell” rule when it comes to character development. Yet those bizarre inner-mind powers also end up providing one of the best parts of Cloak & Dagger. The series initially plays it safe, cross-cutting continually between the two characters as they live their everyday lives, but it finally starts to build momentum when it casts aside standard-issue storytelling and gets weirder with its structure and the nature of its narrative. The third episode improves things markedly when it takes a lengthy digression into hallucinatory visions, dressing up some occasionally on-the-nose metaphors with lovely and unusual design. Similarly, the fourth installment jettisons the constant panning between Tandy and Tyrone in favor an episode-long conversation between the two main characters, jumping back and forth in time for various other scenes yet always returning to their heart-to-heart discussion. These are bold and unusual tactics to attempt so early in a show’s life, and it benefits greatly from them. The other most promising aspect of the series is how unflinching it is when it comes to the darker aspects of being a young woman or black man in America in 2018. Tandy may be smart, resourceful, and strong, but she is still vulnerable to assault, and constantly balancing the privilege of her status as an attractive young white woman with the sexism, mistreatment, and threats derived from those same qualities. Similarly, Tyrone enjoys the upper-middle-class lifestyle and security of a solid family making a decent living, yet is constantly reminded of how quickly it could all mean nothing. In the first episode, when he berates his mother for always putting impossible pressure on him to do better (“Like you’re afraid if I don’t do everything perfectly, you’re gonna lose me”), her tear-filled eyes and quavering response pull him up short: “I’m afraid you’re gonna do everything perfectly and I’m going to lose you anyway,” says the woman who already had one beloved son murdered for no good reason. The dialogue has an unfortunate tendency to pivot into the odd clunky or overwrought line, and minor characters are often reduced to pure cartoonish saintliness or villainy (when the basketball coach punishes the entire team for Tyrone’s lateness, his posh white teammates literally beat him into unconsciousness on school property like it was Full Metal Jacket). But while the scripts are of uneven quality, especially in the early going, the direction rarely is. Gina Prince-Bythewood (Beyond The Lights, The Secret Life Of Bees) helmed the pilot, and the visual style she establishes is well above the often-bland look of Freeform’s normal offerings. With a stark chiaroscuro, Prince-Bythewood turns the New Orleans setting into a lush and multifaceted locale more akin to the far-reaching scope of Treme than the generic Bourbon Street-and-suburbs for which it’s often stereotyped. She gives Cloak & Dagger the look of a ’90s cinematic thriller, with some nods to early David Fincher in the framing and lighting. 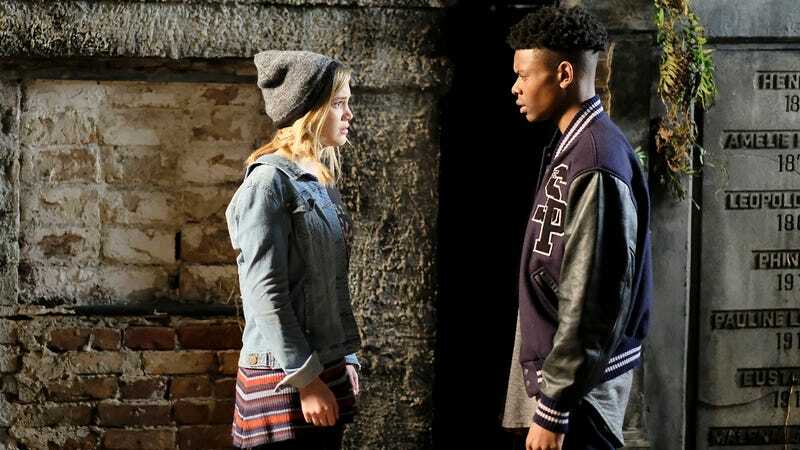 It’s a rocky start, but once the series leans into its more formally audacious structures and brings its two leads together, Cloak & Dagger finds its identity and gives viewers a reason to invest. Here’s hoping it learns the lessons of rookie mistakes made by Daredevil, Runaways, and more, and dispenses with the hemming and hawing over whether to push its stars together and get them into action. Holt and Joseph are excellent once they can play off each other, and the electric frisson they generate starts to evaporate whenever they’re kept apart too long, pulling the show back down into more typical teen-drama fare. Like its unusually gifted heroes, Cloak & Dagger should embrace the weird.